"It's a grand day, isn't it, Gus?" breezed Dr. Marvin, as he pulled up at the shop door of the Model Garage one morning. "But," he added ruefully, "I'd enjoy it a lot more if my car was running better." "What's the trouble?" Gus Wilson asked, stepping out into the sunlight. "That's just what I don't know," the doctor told him. She just doesn't run quite right, that's all. Bucks when I'm running slow in high gear, for one thing." "What sort of a doctor are you?" Gus demanded. "Huh? Oh, I see. Why, I'm a pediatrician -- a kid's doctor, in plain English." "Well, Doc," Gus said, "when you're called in to attend some youngster you don't know, and you're not certain just what's the matter with him, what's the first thing you do?" "Nine times out of ten," Dr. Marvin said, "I put my stethoscope on him, and see how it's ticking inside." Gus grinned. "Well," he said, "I'm a sort of gas-engine doctor. I'm going to put a stethoscope on your engine, and see how it's ticking inside. Only I call my stethoscope a vacuum tester -- or a trouble shooter. Drive her in, will you, Doc?" From a cabinet Gus took a dial-faced instrument to which was attached a length of rubber tubing. After connecting the free end of the tube to the car's intake manifold, he hung the instrument on a handy nail and adjusted the car's throttle so that the engine would run a trifle faster than idling speed. Then he and Dr. Marvin watched the black hand on the dial. It moved steadily up the scale to 20, stayed there for a moment, dropped back to 15, climbed to 20 again, dropped back to 15, climbed again. "Sticky valve," Gus said, "That's a lot easier than the old way of pulling an engine half apart to see what's wrong with it, isn't it? If you know how to use one of these vacuum testers, it'll show up almost anything that can go wrong in an automobile engine." He disconnected the tube. "Phone sometime when you're not going to need the car for a couple of hours," he suggested. "I'll send Harry over for it, and we'll check these valves." "All right, I will," Dr. Marvin said, absent-mindedly. He picked up the vacuum tester and examined it interestedly. "Quite a gadget," he remarked. "Darned if I wouldn't like to have one, only I suppose it would be a waste of money for me, with only one car and mighty little time to work on it." "Maybe so -- maybe not," Gus said. "I can show you how to make a vacuum tester that'll do the work pretty nearly as well as this one, and that will set you back less than a dollar. Doing anything this evening?" "Nothing special," Dr. Marvin told him. "There's one case I might get a hurry call on, but -- "
"Tell them to switch your hurry calls over here," Gus said. "You come over about eight, and we'll go to it -- won't take us over an hour or so. Oh, by the way, Doc -- bring along a small bottle, will you? Two-ounce size." After the customer had driven off, Joe Clark came out of his little office, shaking his head accusingly at his partner. "Yeah, I heard you," he said. "You'll never be a business man, Gus. Now, when my missus calls Doc Marvin over to look at one of the kids, do you think he tells her who to find out what's wrong with the youngster, and what to do about it? No siree! He does the job himself, and puts the five bucks in his pocket. How can we make money if you tell our customers how to do their own trouble-shooting?" "You're right, Joe," Gus grinned. "I'm no business man, but I know that there's such a thing as good will. If a man likes to tinker with his car, and I tell him how to do a fifty-cent job for himself, it's a pretty sure thing that when he has a fifty-dollar job, he'll bring it to us." When Dr. Marvin got around to the Model Garage that evening, he found Gus at his workbench planing off a piece of three-quarter-inch board thirty-two inches long and four inches wide. "Thought I'd better get started on the carpenter work," Gus remarked. He screwed a four-inch-square piece of half-inch stuff to the longer board, so as to form a shelf at its bottom. There -- that's the backboard of our trouble shooter," he said. "Bring that little bottle, Doc?" Dr. Marvin produced a two-ounce bottle. "Right!" Gus said. He motioned toward a pair of metal shears and a piece of sheet tin lying on the workbench. "While I sandpaper this backboard," he directed, "you cut off a half-inch strip of tin maybe a foot long -- we'll need it to make straps. Now let's have that bottle." He measured it with his eye, snipped off a piece of tin long enough to make a strap from the half-inch-wide strip that the doctor had cut, placed the bottle carefully on the center of the shelf at the bottom of the backboard, and screwed on the tin strap so that it held the bottle securely in place. "Now for our scale," he said. "I had a nice, clean yardstick somewhere around here -- yes, here it is. It has an ad for Henry Miller's hardware store on it, but it will serve the some purpose as the scale on the dial of that tester we were using on your car this morning." He cut the yardstick off at its thirty-two-inch mark and nailed it to the center of the backboard so that its lower end was even with the top of the bottle. Then he poured quicksilver into the bottle until it was about half full, and produced a rubber stopper from one of his pockets. "Notice this stopper, Doc, in case you ever want to make another of these gadgets," he said. "You'll see that I've drilled a hole in it big enough to push a quarter-inch-diameter glass tube through -- with a tight fit -- and that I've also cut a little triangular air notch in one side of it." From the shelf over the workbench he took a thirty-six-inch length of glass tubing and a five-foot length of quarter-inch rubber tubing. From the rubber tubing he cut three half-inch pieces which he worked over the glass tube so that the lower piece was about twelve inches from the tube's lower end, the middle one about twenty-two inches. "They're to keep the tube from breaking when I strap it onto the scale," he explained. Then he inserted the glass tube in the rubber bottle stopper and pushed it through carefully until its end reached the bottom of the bottle. "That's important, Doc," he cautioned. "You've got to get the end of the tube just as far down in the bottle as you can without actually touching the bottom." Fastening strips of tin over the half-inch pieces of rubber tubing with thin screws extending through the yardstick scale into the backboard, he strapped the glass tube firmly to the scale. 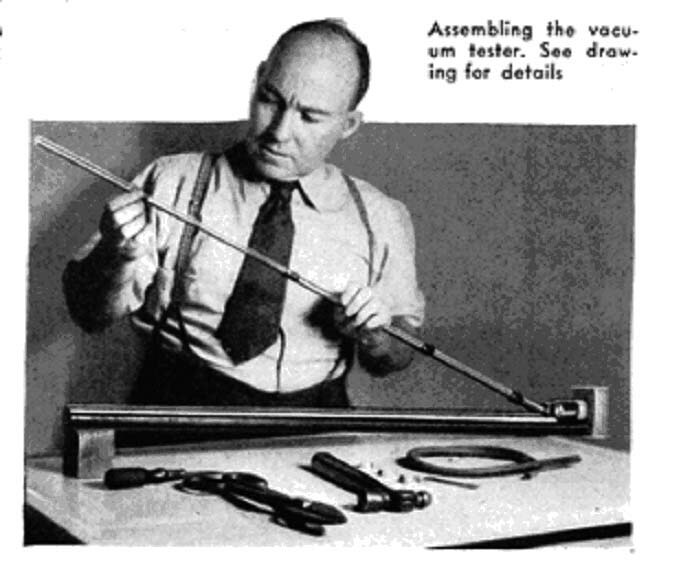 Then he worked an end of the length of rubber tubing over the upper end of the glass tube, and surveyed the job with satisfaction. "There she is, Doc," he said. "Didn't take over an hour to build either. Maybe she's not quite as shiny and impressive-looking as a bought vacuum tester, but she'll do a good job of trouble-shooting for you. "Now I'll show you how she works," Gus went on. "Let's try her out on my car." He got into his ancient but perfectly kept coupe, started its engine, and let it run until it was thoroughly warmed up. Then, leaving the engine running, he got out, raised the hood, disconnected the windshield-wiper hose from the intake manifold, and connected the free end of the trouble-shooter tubing in its place. "Watch the mercury column in the glass tube, Doc," he said. "It will go up to about the twenty-inch mark, and stay there. How about it?" "Right!" Dr. Marvin said, his eyes on the quicksilver. "It's at twenty inches, and it's steady there." "Now," Gus said, "I'm going to retard the spark. The mercury will drop to about sixteen inches." "Any engine that is functioning properly," Gus explained, "will pull the mercury column of this trouble shooter up to about twenty inches on the yardstick scale. If you hook it onto an engine and the quicksilver goes up to only sixteen inches, there's a chance that the trouble is a retarded spark. So, before you go any farther, check over the ignition system to make certain that plugs, breaker points, and spark advance are set according to the factory specifications. After you have done that, hook on the tester again. If the mercury still refuses to climb, you'll have to do some more trouble-hunting. "Perhaps the difficulty is that the carburetor isn't adjusted correctly. Make your mixture leaner and richer, and note at which point you get the highest reading on the scale. That's the point at which your carburetor should be adjusted. Now, Doc, you bring your car in, and we'll find that sticky valve." Dr. Marvin drove his car into the shop. Gus attached the tester tube to its intake manifold. "Just let the engine idle," he said. "Now watch the mercury column. See how it drops periodically, and then climbs again? That's a sure indication of a sticky valve. Now we'll find out which valve is sticking." He removed the valve cover plate. "Watch the valves open and close, and at the same time keep an eye on the mercury column," he said. "It will drop when the sticky valve opens. There she is -- No. 3 cylinder. "You can use your trouble shooter to adjust valve tappets, too," he went on as he straightened up. "Get your engine real hot, and then close the tappet clearance of each valve -- one at a time, of course -- until the mercury column begins to drop. That's a good way to cure a noisy tappet -- and still be certain that there is enough clearance to keep the valve from holding open or burning. "This homemade trouble shooter will tell you a lot of other things about an automobile engine. If the mercury column keeps oscillating pretty rapidly between fourteen and twenty inches, it shows that the valve guides are worn, and should be replaced. If the engine, while idling, won't pull the mercury column above six or seven inches, look for a blown gasket in the intake manifold, between the carburetor and the manifold. If you find that that isn't the trouble, look for a cracked or broken intake-valve spring. "With the engine idling and the mercury column up to twenty inches, speed up suddenly. The mercury column should at once drop to five inches, and stay there. If it doesn't stay there, but fluctuates up and down, the valve springs are weak. "Speed up the engine and watch the quicksilver as you let go of the throttle, so that the engine drops back to idling speed quickly. If an engine is in really good condition, it will pull the mercury column up to twenty five inches momentarily. If your engine doesn't do that, you'd better have a look at the piston rings. "Using poor oil, or the improper grade, sometimes has the same effect as worn rings, but the odds are at least ten to one against the oil being the cause of the trouble. "If, when the engine is idling, there is a sudden heavy drop in the mercury column, it's a sign of a blown gasket between cylinders. You can tell which cylinders, by holding a screw driver against each plug -- one at a time -- and noting which cylinder fires as the mercury column drops. If you have a blown head gasket, the only sensible thing to do is to have it replaced at once. "If the trouble shooter indicates that your engine is in good condition, but your car bucks when you are running at low speed on the road, don't cuss the trouble shooter -- or me. Take a look at your windshield wiper and its hose, and at your spark coil. Any one of the three may be causing the bucking. "Well, the trouble shooter is yours, Doc. I hope you have as much fun using it as I had making it." "I will, Gus -- you can bet on that," Dr. Marvin said. "And thanks for making it for me. But how much do I owe you for materials?" "Well, now, let's see," Gus said, beginning to jot down figures. "The backboard came out of a packing case, so it didn't cost anything. The yardstick's with the compliments of Henry Miller. The druggist charged me thirty-five cents for the mercury, and two cents for the rubber bottle stopper. The glass tube cost fifteen cents, and the rubber tubing twenty cents. That adds up to seventy-two cents, doesn't it? Told you the gadget would set you back less than a dollar! And you'll get many a dollar's worth of fun and service out of it. Next time your engine acts up, just pretend it's a sick baby and try out your vacuum-tester stethoscope on it!"